I think it is due to some of the tutorials I wanna put have been found somewhere else, and I wanna enjoy other stuff other than this blog (I have my life to live too). As for the tutorials, I will post them if I have the time and mood to do so. Sometimes, I am worried that my tutorials may not turn out very nice (due to software limitations). Also, sometimes, I fear that certain stuff are just too complex to be mentioned briefly. Eg. a very long tut, consisting of many sub-steps. I know finding the information on how to do the many, many tiny sub-steps can be tiring. I know that gloss buttons is quite a common tutorial in the web. And the famous gloss effect is used so widely, it is almost an overkill. But, the gloss button tutorial is still widely sought after, due to its cool and classy look. And despite how simple it looks, to get a nice gloss effect is not that easy as you think. So, in today's tut, you can learn how to create vista-ish looking gloss buttons, directly in flash. No other graphic programs needed. In the create new symbol window that popups, select movie clip for your symbol. Lets name this symbol background. The height of your rectangle is 2x the height of your symbol. This rectangle should not have any border. If you happen to create a border accidentally, just select the borders and delete them. The rectangle is the gradient for the button. Click on the rectangle and In the color window, select the fill to be radial. Then for the left color, use #666666 and the right, use #000000. (to create a rounded rectangle, in the click the set corner radius button). For this rounded rectangle, put the rounded radius to 2 points. Go back to scene1. Then click insert a new symbol. This time, in the create new symbol window, select button as the type of symbol. Lets name this button1. In Button1 symbol, drag the background symbol from the library window onto the stage. Select the backgorund symbol. Then, in the properties window, click on filters and add a glow. Make a new layer again. Zoom out enough, so the button is about 1/3 the width of the view. Then create an borderless oval 3x the width of the background, covering only the top half of the background. In the color settings, choose radial for the color fill. 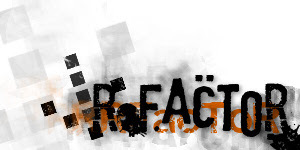 The left color is (#FFFFFF, 35% opacity), The right color is (#FFFFFF, 10% opacity). Create another new layer. Choose the rectangle tool. With your rounded rectangle settings you have entered just now, draw a border around the background. The width of the border is 1.25px and the color of the border is #CCCCCC. Go the the layer containing the highlight again. With the selection tool, select the parts of the highlight oval not covering the background and delete them. Add a keyframe to the end of the timeline for all layers. (Rightclick the hit frame and click insert keyframe) For the layer containing the background symbol, make a keyframe for the over and down frames too. In the over frame, go to the layer containing the background and select the background symbol. In the properties window, set the brightness of he background symbol in the hover state to 8%, and in the down state to -11%. Thats the end of this tutorial :). Do remember to save your hard work in a .fla file before exiting flash. You can use this button in your websites or flash applications. Maybe you may wanna tweak the settings of your button to suit your own site's color scheme or add some more effects to this button. Hey guys, here's another sig tut.... This one is mostly for those anime graphics stuff... you may have seen them in some forums. For this tut, the style is a bit cute, mixed with some grunge... hope some of you guys like it. Anyway, take a look at the result. For today's tut, you will need to have 2 fonts. The links are at the end of this tut. For the time being, lets take a look at the steps. For this tut, the background is colourized into a pink shade. (Adjust>>Hue and Saturation>>Colorize) The saturation of the colorizing is at 201 and the hue is at 240. Now, you have to duplicate the background layer (rightclick the background layer in the layers toolbar, and click duplicate). After motion bluring, you can make the layer slightly transparent by sliding the opacity meter in the layer toolbar. In this step, we are using the AirBrush tool to add some streaks of diagonal lines! Then, In your top color, choose the texture to be streaks, with the angle as 45 and the size as 55. Create a new layer (right click the current layer and click new raster layer) for this round of brushing. Then, Using your top color as black, do some streaks at the borders. Then, Using a saturated yellow, (hex code: #FFCE25) do a bit of brushing in the middle. With two dingbat fonts, you enter some hearts and grunge vectors. Size the fonts to a suitable size. Do a bit of rotation to each letter. The fonts can be downloaded at the end of this tut. Then select the paint bucket tool, and choose the letters1 texture in the main color. Choose white as your color as well. With your paint bucket, fill in the polygons. Duplicate the layer containing your character. Then, using the resizing tool, Invert the layer below your character, and drag it below the character. Create a new layer for this step too. Remember the step where you add those dingbat characters? This is just a repeat of the step, just that the color of the vectors is white (pls deselect any texture in the color window, as the font shouldn't have a texture applied to it in this case). For my example, the vectors are being rotated and is in a larger size now. In The same layer as the vectors, you can insert some text. Duplicate the layer in which you have your vectors and your text. Create your final new layer. (You don't have to really draw staright lines, the objective of this step is to allow you to create a frame that looks like it's been drawn by hand). With that, this tutorial has reached its end! You may wanna use your own anime images.. or what ever stuff. Even if this tut does not really suit your taste or style, I hope it has enhanced your knowledge of paintshop and you have learnt some new techniques from it. This is quite a useful effect in paint shop pro, quite common in the media. It is actually meant to enhance an image. This short tutorial will help ppl who don't know learn how this effect is achieved. 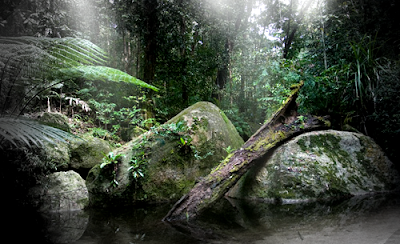 For this tut, this image choosen is a pic of a rainforest, found in google. Select the middle of the pic, leaving a thick area around the selection, then delete the selected region. Select the whole of the greyscaled layer. Now, with the freehand selection tool with the feather on, change the replace to remove. Then, select the region not to be blurred (a bit smaller then the area of the image). The following screenshot shows you how the selection should look like. Choose the Freehand Selection Tool again. But this time, set the feather to 0. Use it to make selections that look like lightrays (some thin pointed triangles that poke down from the top of the pic). With the selection, use the Paint Bucket Tool and fill them up with white, opacity 100%. Erm, I think today I'll make a tutorial, on how to make grunge text. I try to make it short and sweet, so you guys can do it right away. Then use the text tool to make some text. You do need to promote it into a new layer, so as to make things easier to edit later on. In the layer toolbar, right click the newly made selection (thats the text you've just made), and click promote selection into a layer. Pls note the color being used (orange), it is in the material toolbar on the right. The font size depends on how big you want the font to be, for me it is size 29. The border of the text should be 0 and all other values are kept as the default. You use the smudge tool (If you don't know where is it, it is somewhere in the toolbar on the left) ..to smudge the orange text on its left edge. Once the smudge tool is in your hand, you can adjust its settings.. For this example, I've used a circular brush of hardness 100%. Pls note that the opacity of the smudge tool is set to somewhere around 60%-80%, and the step is 24 (so as to make the smudge fade away). The others are at 100%. If you are not sure, pls click on the screenshot to counter check your settings. Then, use the font tool again, to create some black text. Also, for this time, promote the text selection into a new layer. I'm not saying the font now, because it will be very messy it i do so. But the text Must be promoted into a layer! You might wanna, do a drop shadow to the text for a nicer look (It is found in the top toolbar: Effects>> 3d effects>> drop shadow). After making the text, It's time to duplicate it's layer and smudge it! (If you had not known yet, it can be done by right-clicking its layer in the layer toolbar, and clicking duplicate). Remember the smudging you have done to the orange text? Now, you gotta use the smudge tool again. You don't really need to adjust it anymore, cuz' you should have set it correctly for the orange text previously. On the new layer, you can use to smudge the black text here and there. After the smudging, you have to drag the smudged black text to the bottom of the layers. In The layer toolbar, drag the black smudged text to just above the background. Because this font hasen't been "pre-eroded" to make a grungy look, you may want to use the eraser tool to erode it yourself.. In the settings for the eraser, the marble4 brush is preferred (Actually, any marble brush can do). Remember to scale it down to 25, so it will be small enough for the splats. Brush a little on the edges. Create a new layer above the background. Select the airbrush tool, and choose the pencil edge medium brush (as shown in screenshot). Then, brush sparingly on the layer, around the text, just enough to make some parts darker. Basically, it is just another repeat of step 5, but just that now the subject is an arrow instead of ink splats. Then, make another semi-transparent layer with a bigger logo and us the smudge tool to smudge it about ( for layer tansparency, you can set it via the opacity silder in the layer toolbar). Once you have gotten the hang of it, you can use this tatic for your own banners, websites... etc. And talking about the ink splat part, it was kind of a weird method, but you rather save time by using others's pre-made splats instead of drawing one yourself.